In India, mutton often refers to goat meat instead of sheep. It is cooked in numerous delicious ways. 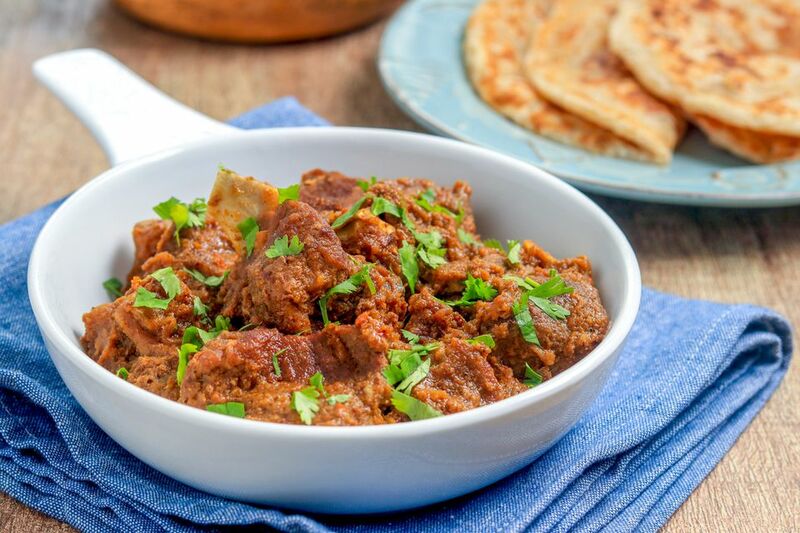 This simple, yet delicious version of goat curry or mutton curry is also easy to put together, and you can use goat meat or sheep. Goat curry or is delicious served with plain rice, a salad, and raita. If you thicken the gravy, it tastes just as good with hot, freshly made chapatis. Heat the cooking oil in a heavy bottomed pan, on medium heat. When hot, add the onions. Sauté until the onions begin to turn a pale golden brown. Now remove from the oil with a slotted spoon and drain on paper towels. Turn off the heat. Grind the onions into a smooth paste (adding very little to no water) in a food processor. Once done, remove into a separate container. Now grind the tomatoes, garlic, and ginger pastes together in the food processor, into a smooth paste. Remove into a separate container and keep aside for later use. Heat the oil left over from frying the onion and add the onion paste. Sauté for 2 to 3 minutes. Now add the tomato paste and all the powdered spices, including the garam masala. Mix well. Sauté the resulting masala (onion-tomato-spice mixture) until the oil begins to separate from it. This can take up to 10 minutes to happen. Next, add the goat/mutton pieces to the masala, season with salt to taste and stir to fully coat the goat/mutton pieces with the masala. Sauté until the goat/mutton is browned well. Add 1/2 a cup of hot water to the pan, stir to mix well, simmer the heat and cover the pan. Cook till the goat/ mutton is tender. You will need to keep checking on the goat/mutton as it cooks and adding more water if all the water dries up. Stir often to prevent burning. The dish should have a fairly thick gravy when done. When the meat is cooked, garnish with chopped coriander and serve with hot chapatis (Indian flatbread), naan (tandoor-baked Indian flatbread) or plain boiled rice. Use a pressure cooker to cook curry, and it will be done in half the time it takes to cook in an open pot.